Whether through exploitation, occupation or commodification, control over space has become nearly total in large metropolises. Time, however, is a far more elusive dimension of modern life. When the working day ends, cities continue creating an intangible value from time itself. In the early years of the twentieth century, the factory siren would resonate on working days in industrial neighbourhoods, waking up sleepy ex-peasants to get them started on schedule in the mill. Such routines, mechanically repeated day after day by armies of workers shaped the modern metropolis – its tempo becoming an injunction. Masses of people commuted regularly to places of work – which were increasingly divided from residential areas by zoning laws and rising prices near centers of activity. Salaried laborers kept moving further to the periphery, spending an ever-increasing amount of time commuting back to distant settlements. Soon places bustling at day would become deserted at night. All through the twentieth century – whether under the tyranny of capitalist work, communist control, fascist governments or colonial rule, cities became spaces where the night was valued as a moment of freedom. Nightclubs and bars were spaces of escape (and perdition too), but also spaces of subversion of the dominant regime and creation of alternative moments. Day-time institutions have always tried to control nighttime movements – by shutting down public transport after midnight, by regulating opening times of establishments, and forcefully evacuating public spaces at night or morally policing people who followed different rhythms. However, an increasing number of cities understand that the night also means business. The Dutch dancing industry alone is said to be worth EUR 600 million a year. The mayor of London is up in arms to defend its share of a £ 28 billion a year night time economy against the threat of gentrification, which is forcing an increasing number of venues to close down. Today – the poster free-city of Amsterdam boasts of its own “Night Mayor” – and ever since the self-appointed position got civic endorsement – has never looked back. This truly twenty-first century city is one which is not scared to stretch itself all the way to the end of the night. The Night Mayor’s task is to make sure that the dark hour is safe for women and minorities, ensure that nocturnal industries bring in huge revenue to the local government and nurture alternative venues, that may not be remunerative but create huge cultural capital. Soon after Amsterdam’s Night Mayor Mirik Milan’s appointment - Paris, Zurich, Berlin, New York City and Toulouse – appointed their own Night Mayors. Sadiq Khan, the (daytime) mayor of London, feels that intervening actively to promote nightlife is vital to maintain a city’s talent and culture. He appointed a “Night Czar” to help protect and nurture this unique and most valuable resource. Startups and Tech companies also take nightlife seriously. This dimension clearly weighted in Google’s decision to open its “campuses” in Berlin, London, Madrid, Sao Paulo, Seoul, Tel Aviv and Warsaw - cities which are all famous for their night scenes. If all this seems remote from the concerns of Indian cities – think again. Studies on safety for women point out how active neighbourhoods and 24 hour zones help create more secure environments for all. Through most of the year, Indian cities are outdoor weather friendly at night. So many festivities, rituals and celebrations are traditionally nocturnal. If the crowds on Mumbai and Chennai’s waterfronts are any indication, individuals and families from all classes and age-groups love to stay on and enjoy nights in the outdoor. Cities reveal themselves at night. However, before anyone proposes 24h malls and clubs in five-stars hotels, let us remember that what creates good night life is a genuinely inclusive and diverse public space that needs tolerance more than control or commodification. This article was first published in The Hindu Sunday Magazine on June 24th, 2018. 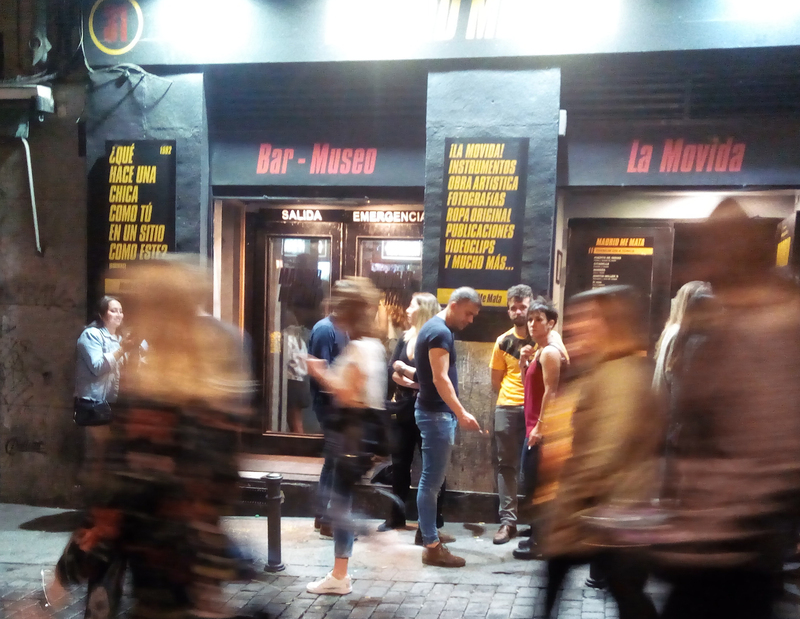 Nightlife in Malasaña, Madrid - a neighbourhood historically marked by the "modiva", a wave of freedom and creativity that transformed Spain's cultural landscape in the 1980s at the end of Franco's fascist regime.